Grammar in the context of a compiler. Ie how to define it. See the grammar section if you are interessed on the structure. In processing computer languages, semantic processing generally comes after syntactic processing, but in some cases semantic processing is necessary for complete syntactic analysis, and these are done together or concurrently. EBNF grammar of w3c: See Xquery or Xml. The same ? Words – the lexical level, determining how characters form tokens. In a compiler, this is the lexer works to discover Words. Phrases – the grammar level, narrowly speaking, determining how tokens form phrases. In a compiler, this is the parser works to discover Words. Context – determining what objects or variables names refer to, if types are valid, etc. In a compiler, this is the work of the semantic analysis to add context. For example, a correct sentence always consists of a subject followed by a predicate. subject   = "John" | "Mary". predicate = "eats" | "talks". 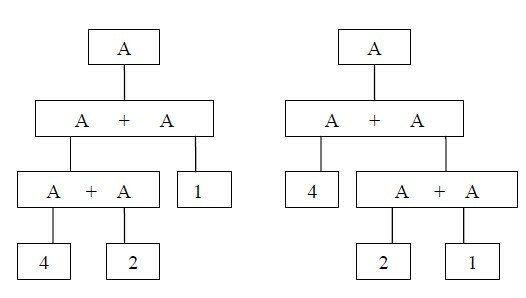 A = "a" | "b". B = "c" | "d". The set L of sentences which can be generated is called the language. It consists of only four sentences. Nesting is a property particularly important in the definition of structured languages. structural trees or syntax trees. because they cannot be substituted by any other symbols. John, Mary, eats, talks. syntactic equations productions set These define the possible substitutions of non-terminal symbols. An equation is specified for each non-terminal symbol. A language is, therefore, the set of sequences of terminal symbols which, starting with the start symbol, can be generated by repeated application of syntactic equations, that is, substitutions. The idea of defining languages and their grammar with mathematical precision goes back to N. Chomsky. It became clear, however, that the presented, simple scheme of substitution rules was insufficient to represent the complexity of spoken languages. This remained true even after the formalisms were considerably expanded. In contrast, this work proved extremely fruitful for the theory of programming languages and mathematical formalisms. In passing, we emphasize that this rigour applied to the syntax only, not to the semantics. The use of the Chomsky formalism is also responsible for the term programming language, because programming languages seemed to exhibit a structure similar to spoken languages. This term is rather unfortunate, because a programming language is not spoken, and therefore is not a language in the true sense of the word. Formalism or formal notation would have been more appropriate terms. The structure of a (well formed) sentence is relevant, because it is instrumental in establishing the sentence's meaning. Owing to the syntactic structure, the individual parts of the sentence and their meaning can be recognized independently, and together they yield the meaning of the whole. expression = number | expression "+" expression. number = "1" | "2" | "3" | "4" . Fortunately, thanks to the associativity of addition both yield the same value 7. 4 - (2 - 1) = 3. Interpretation of sentences always rests on the recognition of their syntactic structure. Every sentence must have a single structure in order to be unambiguous. We call a syntactic class ambiguous if it can be attributed several structures. A language is ambiguous if it contains at least one ambiguous syntactic class (construct).